Jim was recently baptized at my church. I would go to his house every Wednesday and he would be waiting for me. We would go to my house and eat a wonderful meal prepared by my wife. We always gave Jim enough leftovers for 3 or 4 more days. We would then do a devotional study just to stay in the Word. He was diabetic and had vision issues - but wasn't afraid to hold the book right up to his face so he could read. One day I went to Jim's and he wasn't waiting and didn't answer the door. I went inside and found him. He was dead. He had not been taking his insulin or checking his blood sugar because he didn't have money for insulin. Insulin is a drug that has been around since the 1920's. My great grandfather lost both his legs because of diabetes, but when insulin arrived on the scene it kept him alive for another 35 years. His father also had diabetes and eventually died from gangrene. The cost of insulin is literally pennies a dose but I now have clients paying up to $5,000/year for their insulin. Executives from the pharmaceutical companies recently appeared before congress to try and explain why this drug has tripled in price over the last decade. It reminds me of the EpiPen crisis a couple of years ago. Suddenly the lifesaving medication was $600/dose when is had been $60 for many years. Corporate greed in America is literally killing people. I dream of waking up one morning only to discover that the big pharma executives and their related venture capitalists were rounded up during the night and are now staying rent free in Gitmo. I don't think anyone in America would complain. Even the ACLU would be hard-pressed to make their case. A recent popular TV sitcom made a lot of jokes at the expense of big pharma. The Medicare couple would split the drugs up each month between the two of them because they didn't have enough money for full proper prescriptions. When you think of the advertisements that surround the evening news you realize that the networks rely on big pharma for a lot of their revenue. It was not surprising when the sitcom was taken off the air. I don't think political correctness was the real reason. 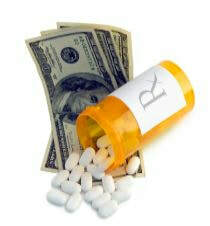 I listened to a spokesman explaining why Americans need to pay more than anyone else in the world for our drugs. If we don't we'll die because of a downturn in research and development. This is fear mongering of the first order. We just need corporate America to justify the pillaging of senior citizen bank accounts. I say it's time to round them up and set an example.